Transparency Market Research (TMR) witnesses that the global lubricant market has a highly consolidative vendor landscape. The four companies accounted for near shares of 58.0% in the year 2016. However, the major player, FUCHS, accounted for a share of about 37% in the year 2016. Other prominent players operating in the global lubricant market are Motul, ADDINOL Lube Oil Gmbh, BVA Oils, AMSOIL INC., Carlube, BVA Oils, and Forsythe Lubrication. The lubricant market is literally dominated by few players; however, the presence of numerous small players and new entrants in the market are increasing level of competition in the market. Market players are increasingly focusing on the improvement of distribution channel and keeping the product pricing competitive. Major players in the market are focusing to offer innovative products, which are widening opportunities for growth. 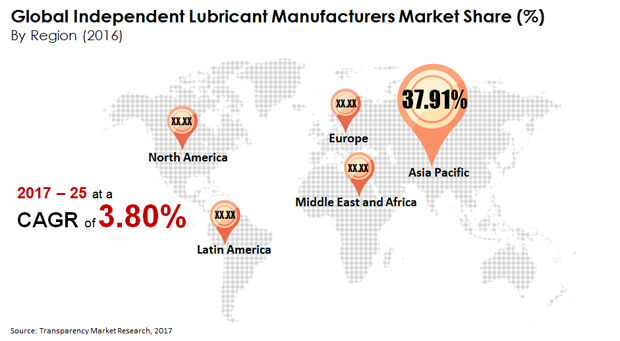 According to TMR, the global lubricant market accounted for a revenue of US$6,800.79 mn in the year 2016 and is expected to reach US$9,454.04 mn by 2025-end. The market is expected to expand with a CAGR of 3.80% over the forecast period from 2017 to 2025. On the basis of application, the automotive segment dominated the global lubricant market and likely to hold the major share in the overall market. Based on the regions, Asia Pacific is anticipated to offer lucrative opportunities for key players. The growth in the region is attributable to the growth of automotive industry coupled with the presence of major suppliers of base oil in the region. The lubricants market is primarily driven by the extensive demand for lubricant and oils across the automotive industry globally. Growing demand for lubricants and metalworking fluids across industries such as booming automotive sector, marine, aerospace, and manufacturing industries is augmenting the growth of the lubricants market. This growing demand for lubricants is attributable to the properties of the lubricants such as its water and temperature resistance and its lightweight. These properties are widening applications of lubricants across numerous applications, which are propelling growth of the global lubricant market. Additionally, the rise in demand for high-performance lubricant by various end-use industries in order to obtain better efficiency is supporting growth of the lubricants market. Furthermore, raising awareness assisted by the stringent implementation of governmental regulations, which favors the environmental-friendly lubricants and metalworking fluids. This is a key factor in boosting the lubricants market and likely to remain key factor during the growth of the lubricant market over the forecast period. Despite these factors, the factors such as continuous fluctuating prices of feedstock and raw materials are restraining growth of the global lubricants market. Across the price, sensitive regions and mainly the developing regions is hampering its adoption due to price fluctuations of the final products, which is restraining the growth of the global lubricants market. Nevertheless, a growing acceptance of oil additives is expected to offer lucrative opportunities for growth of the market in a positive direction. Additionally, the emergence of bio-based additives is attracting numerous consumers as well as manufacturers, which is expected to boost demand for environmentally friendly products and lubricants. These factors are expected to open numerous doors of opportunities and reflect positively on the growth of the global lubricant market over the forecast period.